Click here for the Fantasy Diabetes Device - Thursday 5/17 Link List. Today's Prompt: Fantasy Diabetes Device. Today let’s tackle an idea inspired by Bennet of Your Diabetes May Vary. Tell us what your Fantasy Diabetes Device would be? Think of your dream blood glucose checker, delivery system for insulin or other meds, magic carb counter, etc etc etc. The sky is the limit – what would you love to see? No sooner are you diagnosed than you start imagining a device that could make all of this easier. Case in point: Melissa, age 11. Spring of 1991. In fifth grade, my science teacher gave us the opportunity to participate in the Invent America contest, an educational contest designed to spark creativity among kids grades K-8. It was my first school year with diabetes and I knew instantly what my fantasy invention was. I envisioned a pocket-sized (I was a visionary) blood glucose monitor that would read your BG level through a sensor pad. No more pokes. And it took just seconds. "What is the need or problem solved? Diabetics can test their blood glucose level without the pain or bloody mess of pricking their finger. It can fit in your pocket or purse. How does it work? Wipe the sensor pad with the special chemical solution. You press the O (on/off) button. You then press the T (time) button and the machine will have a 5-second warm-up time and then a beep will sound to indicate the machine is ready. You then place your index and middle fingers together gently on the sensor pad. While the machine counts off 10 more seconds, special sensors in the sensor (---> on back)...pad take a blood glucose, or blood sugar, reading through the oils on the surface of your skin. You then press the O button. How is it made? It's made of high impact resistant plastic, a built-in timer, electronic sensors, and a J battery (believe me, there is one)"
That last bit cracks me up. J batteries. Oh my goodness. The meter I was using at the time took these monsters. They were impossible to find. 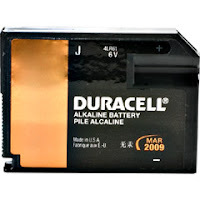 I can't tell you how many drugstore and supermarket clerks my mother puzzled with descriptions of this elusive battery. There was one supermarket with a photo department in the next town over and there were usually 2 or 3 of them hanging on the shelf. And now we can use our iPhones to check our blood sugar. My, how far we've come. Still, when I see those misleading commercials (aimed at Type 2s, usually) that promise "pain-free" testing, I have to ask, when is that part coming? Will we ever ever measure anything in human blood without a needle involved? Perhaps my "skin oils" sensor didn't make any sense, but it showed that, as Pollyanna as I seemed about my diabetes throughout those days, the stress of all the poking was in the back of my little mind. I love having a CGMS (continuous glucose monitoring system) - even when it isn't perfectly accurate or reliable. But it hurts like a beeAHTCH to insert those sensors. With a needle. I love having the ability to infuse insulin directly into my skin with a catheter I can barely feel, but I have to poke a sizeable hole in my body to make it happen every three days. With a needle. And I have my FOURTH site infection in a year right now. Luckily, I don't think this one is infected with MRSA like the first two were. One of my only true FREAK-THE-F-OUTS where diabetes is concerned is the very real threat that a long-time veteran of the disease faces. What am I supposed to do when I run out of real estate? What happens when it's all scar tissue? When it's all calloused? When I'm constantly at risk for staph from open wounds infusing liquid into my subcutaneous tissue? What happens when the drugs to fight the staph stop working? What will I do when poking myself puts me as much at risk as NOT poking myself? As I'm just about to hit "Publish" on this post, Sweetie, for the first time ever, is pointing to the pod on my arm and saying "A ouch. A ouch." I said, "No, Sweetie, a pod. PODuh." She looked at me and confirmed: "A ouch." Yes, baby. A ouch. I love this, once cause I think NO PAIN is what we are all waiting for, and 2 cause you have your assignment from school! You have always been a visionary! No pain. That would really be the next best thing to a cure. I love it! Sensor pads are the way to go! Also, I hate the commercials about pain free testing. GRRRRRR!!!!!! Confusing for my littles!! did you win the invent america contest? you should have! i've never even heard of a J battery, wow!